New and exciting opportunities await you! Don’t forget to check out our blog where you will be able to find very useful tips for employment! Wishing you a safe and happy holiday season! independent HR Consulting firm in the Tri-City area. functions… think of us as your outsourced HR department. In today’s labour market can you afford not to invest in your employees? 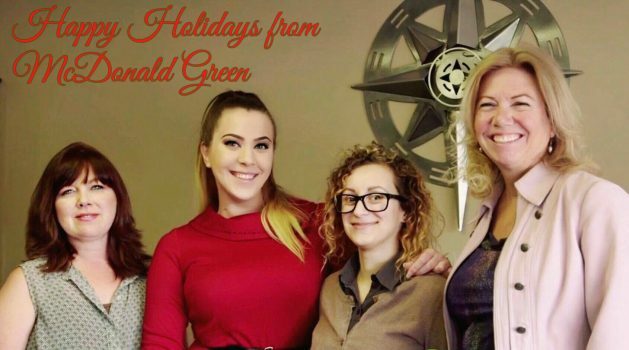 McDonald Green can help point you in the right direction by connecting you with your next employment opportunity; including, short term, contract or permanent positions. We continue to maintain strong relationships with our clients in various industries and sectors, of all levels of employment. Helen Jowett has been named Inspiring Woman of 2013. CAMBRIDGE — Helen Jowett is no stranger to the winner’s podium and yesterday, in front of an appreciative audience, she was presented with one of the most prestigious of her career, the Inspiring Woman Award at the seventh annual Inspiring Women event. Ward & Uptigrove Consulting & Human Resources is an HR Consulting firm operating out of Listowel Ontario. Over the last nine years we have contracted McDonald Green to provide mainly leadership training to our clients out of our office. Due to strong demand we have run the leadership series 15 times. Toni Veiledal is our facilitator. She has received rave reviews from our clients. Toni is very knowledgeable, enthusiastic and strongly encourages participation. The participants love her. I have taken the leadership series myself. I really enjoyed the series. I have able to apply many of the techniques covered in the workshops. Contact me if you wish to discuss further. With experience as a technical support specialist, Michael is able to support his customers with strong service in both English and French. Excellent communication and interpersonal skills allows him to identify issues and find the best possible solution overcoming any language barriers other might struggle with. Not only is Michael comfortable with technologies, he’s performed as a senior collections supervisor responsible for ensuring proper techniques when dealing with customer calls and credit issues. With 18 years of experience, Allison is excited to find a company where she can shine. With proven knowledge and experience in administration and bookkeeping, Allison has what it takes to complete daily operations. Dependable and hardworking, she has been responsible for all aspects of payroll administration, all duties dealing with year-end financial, month end and quarterly financial activities and supporting duties involved with accounts receivable functions. Allison uses her excellent communication and interpersonal skills matched with analytic and problem solving abilities to build partnerships, motivate staff and maintain excellent relationships with clients. Cynthia is motivated by working with people and is looking for the right opportunity where she can put her years as a customer service representative to use. With over 10 years working in Customer Service and Sales she is able to communicate and organize goals in order to satisfy customer needs and maintain company values. She prides herself on her ability to problem solve, achieve results and adapt quickly to new tasks and work environments. Not only is Cynthia trained and experienced with supervising, but she also is fluent in Spanish. She would be a great person to join your team! Devin comes to McDonald Green with a strong aptitude for information technology with a background in project management. Devin appreciates the importance of corporate culture and working as a team to achieve common goals in order for a company to succeed and is looking to find a place where he can grow his network and lead a team. He is a dynamic and reliable professional with a strong engineering and technical background with a thirst for process improvement. With his extensive experience and education with various software and hardware tools used to meet business objectives, Devin would be an incredible addition to your team. Additional skills include his strong communication skills at all levels including internal teams, training of resources, engaging with Executive teams and exceeding customer expectations. Serena comes to McDonald Green with a strong background in Executive administration and management/team lead. Known for defining and implementing a shared vision which encourages creativity, productivity, results and excellence to achieve corporate goals while performing under budget and above client expectations, she would be a great asset to a growing company. With experience leading teams, she understands the importance of communication and customer service. She would excel as a Team Leader or Manager where she can utilize her strong interpersonal skills and commitment to achieve business objectives. Interested in learning more about these or other exceptional candidates?